Secure Storage in Bend, Oregon is dedicated to providing the right services to the right person. 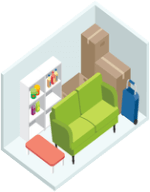 Because we know each person requires storage units for different reasons, we offer 6 different sizes at our facility location, ranging from small to large units. Whether you’re looking for car, bike, business or commercial storage units, we will fit you with the unit size you need, so you won’t have to spend money renting a large space when all you require is a smaller one. Check out our prices and sizes below and call us in Bend, Oregon at (541) 389-8870 to talk to one of our on-site resident managers about reserving a unit today. A 5x10 storage unit is 50 square feet of space. It’s considered a mini storage unit and can typically fit the contents of a medium-sized bedroom, dorm room or studio apartment. A 10x10 unit is 100 square feet and is perfect for the contents of a one-bedroom apartment (excluding large appliances) or a couple medium-sized bedrooms. 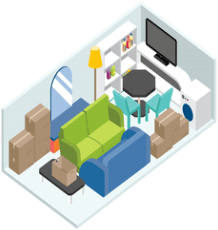 A 10x15 unit is 150 square feet and holds up to three bedrooms’ worth of items, or a one-bedroom apartment including boxes. This size is popular for business storage, to be used as an office storage space for supplies, seasonal decorations and promotional/event booths. A 10x20 unit is 200 square feet of space. It fits the contents of a two-bedroom home with appliances and even miscellaneous items. This size is often times used for indoor car storage as it is the similar size of a one-car garage. A 10x30 unit is comprised of 300 square feet. 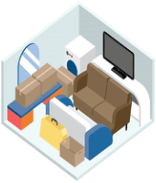 Rental space of this size is convenient for both household and commercial storage. Check out Bend, Oregon storage units for all of your storage needs. We provide short term and long term storage and our rental units are prorated. That means you never have to worry about paying for a half-month’s rent for space that you won’t use! Call (541) 389-8870 to reserve your unit now, or make a reservation online. They were fabulous. So professional,attentive,and accommodating.